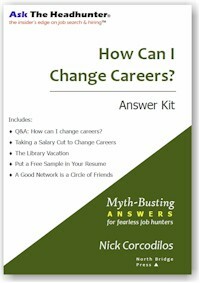 In IYFQ’s: Why you can’t get hired or hire good people, I asked readers to post In Your Face Questions about job hunting and hiring for which there seem to be no good answers. You came through in spades — I cringed often enough while reading them that I know you know what I mean by IYFQ’s. Maybe managers ask the 5-year question to explore the candidate’s career plans. That’s very nice, but not relevant until we establish that the person can do the job profitably. Every interview question is an opportunity for the candidate to steer the manager towards the finish line. A good rule of thumb to guide us is, What does the company’s board of directors want? The bottom line is profit. Companies don’t hire people to fill positions or even to get work done. When the board looks at things, it wants to know, How is each dime spent (on salary, tools, employees) going to produce more profit? That’s where the answer to any interview question must start. Be ready to show a company how you will add to the bottom line, even if your explanation is simple. What matters most is that you try to show them. What you say is up to you. I don’t like canned answers, and I don’t care where you want to be in 5 years until we first establish that you can do this work today and the work that is likely to evolve from it. You can’t ask how people get along. You have to see for yourself, because as you point out, people are on their best behavior in interviews. So, try this, with as disarming a smile as you can muster: “I’d like to sit in on one or two of your work meetings, to see how I fit in. That would give you a chance to see me in a work setting, too.” You will see everything you need to see. This is most easily done after the company has indicated it is serious about you — that’s when they’re likely to comply with your request and show you what you need to see. Try what I suggested to Lucille. As a manager, you could invite a candidate to a work meeting and give them permission to participate as much as they’d like. Take them to lunch with a few of your staff members. (My favorite eatery for this purpose is the company cafeteria.) Sit at the other end of the table from the candidate. Talk little. Let your staffers and the candidate do the talking. Observe. You’ll learn a lot in a natural setting. Charles: How may companies audit their hiring practices and policies? 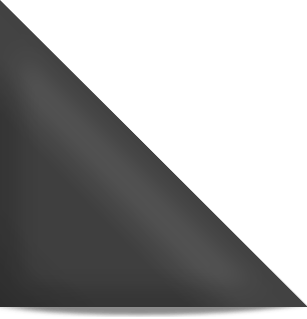 Why don’t companies bother to respond to applicants anymore? Nothing is more infuriating than completing a lengthy application process and hearing NOTHING back from the employer. Why would I want to work for a company that cannot afford the common courtesy of acknowledging my efforts? Companies don’t respond to applicants because they try to deal with too many applicants. When Monster.com provides 5,000 resumes for $200, and an HR department swallows the lot of ’em into its screening process, it just doesn’t have time to respond to everyone. So, the failure to be polite and respectful to its applicants reveals that the company’s process (a) wastes money and resources, and (b) is a sucky substitute for brains. Check this article, Respecting The Candidate: Instructions for employers. If you wouldn’t work for a company that isn’t courteous to applicants, then why interview there? I’d like to see a member of the board of directors show up incognito for a job interview, and report back to the board about the experience. In some companies, the resulting savings could be tremendous. Sucky recruiting practices cost a company its credibility — and good candidates. The few times I have been involved in hiring, I would hire the first applicant that was the right fit for the position. Why waste time and energy (and risk paralysis) trying to decide on multiple, equally qualified applicants? You raise a subtle issue and you put a good name on it: hiring paralysis. That’s the cost incurred from buying into a hiring process that’s ineffective AND unnecessary. I always go back to a George Carlin line: “Suppose you could have EVERYTHING IN THE WORLD!… Where would you PUT it?” I use this to illustrate the fallacy that there is value in having EVERY RESUME ON THE PLANET… because they’re all available online now. 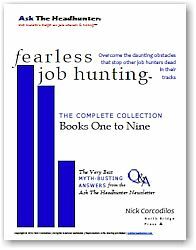 I just want to expose this guy Nick Corcodilos for what he really is – as someone who derives great pleasure in caressing, flattering, stroking, even cajoling, unsuspecting jobseekers into going along with his ideas. All in the name of love. That’s correct: Nick Corcodilos is a love-shower. Not a fighter, but a lover of people. A major league hitter, pitcher, and runner, in the game of love. A FOOL (Facilitator Only Of Love) who helps others learn to find a job, by discovering things for themselves. 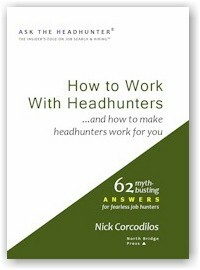 You see, Nick is not really a head-hunter. He has no interest in any personal glory when it comes to finding a candidate a job. On the contrary, Nick must impart the truth; for truly, all answers are within (the love). And what does Nick get for all this “no-fee-for-service” love training? Is it simply to derive some temporary fame from the passing of knowledge? Obviously not. This Nick Corcodilos is no mere man. Nick knows “what goes around, comes around”, and that the doctrine of fate called Karma, as the inflexible result of cause and effect; the theory of inevitable consequence, or reward in the next life, binds us all to each other. 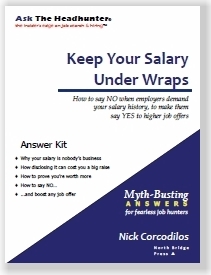 Nick knows it’s what keeps employee and employer apart. Ghandi said, “an eye for an eye, just makes the whole world blind”. Well then, if love is blind, then Nick Corcodilos is the eye-opener. Bravo Nick. Because of your excellent and selfless work in the area of human capital, many will work again. Thanks for the inspiration.